Launched in Spring 2008, SHARP (Safety Helmet Assessment and Rating Program) is a government backed, independent safety rating scheme designed to test the effectiveness of motorcycle and scooter helmets. One of the reasons the Government brought out the Sharp Testing was to try and update the current helmet standards (ECER22.05 and ACU). SHARP enables riders to more easily select a helmet which matches their needs. The tests are designed to provide consumers with an independent assessment of the safety performance of helmets sold in the UK. The SHARP rating tests and reflects the performance of each helmet following a series of advanced impact and abrasion tests in the SHARP lab. 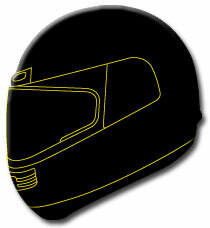 Helmets are then given a rating of 1 to 5 (5 being the best) based on the test results. Initial tests have shown that there are real differences in the safety performance between the different motorcycle helmets available. While they (nearly!) all satisfy the minimum legal requirements for use on the UK roads (ECER22.05), Sharp provides objective advice concerning the level of protection a safety helmet provides which will enable riders to get the right helmet. SHARP offers a single, easy to understand rating for UK helmets. SHARP believe that a helmet that performs well when assessed against the new procedures will offer users a significantly increased level of protection. SHARP research has shown that up to 50 motorcyclists' lives could be saved every year if everyone wore a helmet that scores highly in the SHARP testing system. Look for the SHARP logo and be sure to check out the SHARP rating when you think about getting your next helmet!